Design-build afforded Lane/STV the ability to propose an alternative technical concept (ATC) for a modified interchange, saving $30 million and eliminating any private financing, with tremendous safety enhancements. The I-485 Outer Loop of Charlotte, North Carolina, is one of the state’s most vital urban loops, linking I-77 to I-85 as well as several major arterials. The modification of the existing I-485/I-85 interchange into a fully-directional interchange had long been viewed as the final link needed to help make the Outer Loop a safer and more accessible roadway network for the upwards of 180,000 motorists who are projected to use the loop by 2035. In 2010, the North Carolina Department of Transportation (NCDOT) initiated a design-build-finance advertisement for teams to submit qualifications followed by technical cost proposals. 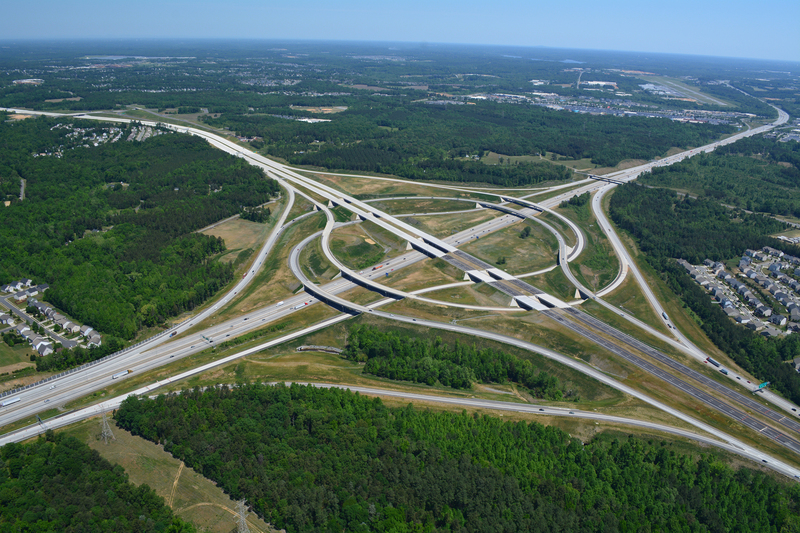 The project’s scope included the reconstruction of the existing I-485/I-85 interchange into a fully directional four-legged interchange that would also connect with the newly constructed I-485 to the north. Two adjacent projects, the widening of I-85 to the northeast and the new alignment construction of I-485 to the northwest, were under design-build development concurrently and necessitated extensive coordination to make the precise geometric connections between the three projects.